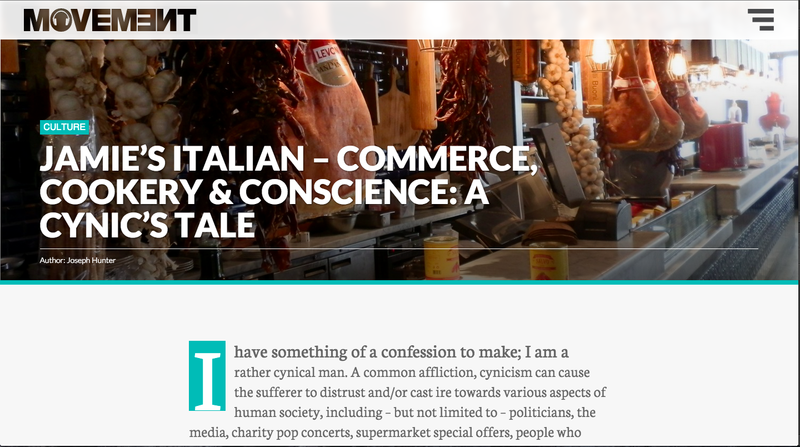 An article I wrote on Jamie’s Italian, Leeds. I have something of a confession to make; I am a rather cynical man. A common affliction, cynicism can cause the sufferer to distrust and/or cast ire towards various aspects of human society, including – but not limited to – politicians, the media, charity pop concerts, supermarket special offers, people who think the film Inception has a complex plot, homeopathy… well, you get the idea. One such focus of many a cynical sneer is the culture of celebrity, so it was with mixed feelings that I found myself heading down Park Row in Leeds to interview two of the team from Jamie’s Italian, a restaurant chain established by celebrity chef, self-styled social activist and occasional target of cynicism, Jamie Oliver. Located in a building constructed for the banking industry – a fact that had my sardonic sensors twitching all the more – the restaurant I expected was one of opulence, expense, and excessive airs ‘n’ graces, the like of which is sure to sour the supper of any skeptic; an array of Jamie’s Italian branded oils, aprons and tea towels on offer in the entranceway only compounded my prejudice. One of the front-of-house team guided me to a table in the bar area, complimentary – and excellent! – coffee was served, and I awaited my victims *cough* interviewees. “Thank Zeus there are still people in the service industry who can interact with customers in a friendly and polite manner, without all the disingenuous ‘yes, sir’ ‘no, sir’ nonsense”, I mused. “She’s probably a one-off”, mocked my misanthropic mind. Hush your mouth, pessimist! I’ve an interview to do. A short while later, two friendly looking faces floated my way. I was introduced to Deputy GM, Luke Johnston and recently promoted Junior Sous Chef, Jared ‘Jaz’ Webb. After some pleasant preamble, we got down to business. Jamie’s Italian Leeds is now in it’s fifth year. Tell us a little about your history with the franchise and how you’ve been part of the restaurant’s development during that time. Luke’s purported desire to provide a relaxed, understated dining environment sat comfortably next to my experience upon arrival; friendly chat, excellent coffee, no nonsense. Can you define what drives that development? Luke – “Over the last few years we’ve really started to develop as a business, listened to our staff, and gotten them much more involved in the direction we take things. I find it fantastic to be part of a restaurant brand that allows you to have input in how we develop as a business. A lot of managers have been on training courses, which culminate in pitching to the CEO ideas that you want to see come into play, how you feel the brand can be improved. Jaz – “Even on a day to day basis in this restaurant, half eleven everyday it’s pre-shift time; that’s all the front of house staff, the chefs, the managers, we’ll cook the day’s specials, talk through the ingredients, the history of the dish and where it comes from. That’s where Jamie has stayed true. That information about a single product, it’s origins… so that everyone is clued up on it, so the information you give to the staff, they’ll then be able to give that information – with their own style and personality – to the [guests at the] table. Now, I’ve worked for some big corporations. ‘Big six’ energy providers, supermarket giants, telecommunications multinationals… each had a ‘brand ethos’ and an urge to indoctrinate that ethos into their recruits. Inductions ranged from the banal (the CEO expects every man to do his duty) to the downright cultish (everybody stand, do a little dance, chant a catchphrase). Listening to Jaz and Luke speak so warmly about their employer, my cerebral smart Alec searched hard for a hint of the parrot-fashion lip service to which I’d become so accustomed. It found none. Being a chef can be notoriously stressful. What made you decide upon this career? Jaz – “It certainly can be stressful, but I’ve found over the years that the way to balance out that stress – to some, this comes naturally, others take a bit of time – is to spread it across your workload; realise what you’re learning and why. The stuff you learn day-to-day is always new, no day is the same. So, getting stressed out, you kind of balance that out by thinking, “what have I actually done today?”, and you pick out the highlights of the day that have been productive; you’ve learnt a few bits, you’ve created something new, you’ve inspired the kitchen team to produce something great, you’ve delivered great food all day, satisfied a few hundred customers, and you’ve made the money to show for it. It’s a lot of variation and sometimes things go wrong. But, one thing I’ve learnt from Jamie’s is they develop in their chefs the ability to manage time properly and to deliver. If there’s a problem, there’s a solution, so you’re always solving that problem, choosing the right path and inspiring your team to go down that path. Jaz – “Career lessons back then weren’t the most enthusiastic! So, I worked washing pots at a young age, and was lucky enough to work there a few years, work with the chefs and learn a few bits in the kitchen. Then I packed my bags and went off to Europe for a few years, working in restaurants around Europe and into the Mediterranean, just to hone my skills and find out what was what. I’ve worked in kitchens 15 years this year, by which time you [should] get to a point where you’re hitting a senior level. If you move somewhere else, I’ve found that there’s 50% of that last job that you need to take with you and 50% that you don’t. Every kitchen, you’ve got to [become] what they need. I’ve worked with hundreds of chefs over the years, but it wasn’t until I moved to Leeds – when I started working at Jamie’s – that I’ve founded the right chefs I need to work for. The whole Jamie’s ethos is what’s kept me here and made me want to really commit to this restaurant. The senior chefs above me are amazing, They teach you a lot and hone your skills a little better. You know, you can flutter around in different restaurants – independent places, chains, 30 covers, 300 covers – but, for me, working for Jamie’s you get to be a professional chef and deliver to a professional standard, which I really like. What advice would you give to others considering a similar path? From Grimsby, around Europe and back to Blighty; that’s one hell of a journey, and yet, I got the impression that here was a man who feels very much at home, both in terms of his chosen profession and with regard to his current place of work. Such a sense of vocational contentment is a rare thing, and the cynic in me sighed inside, as it again found no evidence of the gun-to-head compulsory love for one’s boss that I’ve come to expect from many staff within larger organisations. Raised in the village of Clavering, Jamie Oliver – much like Jared – has been working in kitchens since adolescence. Having since been awarded the honour of MBE, named richest Briton under 30 in 2007, inducted into the Culinary Hall of Fame, and presented with the TED prize, Jamie’s hard work and determination has not only paid off for himself, but also seems to attract similarly minded people to seek employment within his company. A slight rumble of the stomach turned my mind – and our conversation – back towards food. What’s your favourite dish on the Jamie’s menu? Another confession here; I’ve never in my life ordered a meat antipasti. I love cured meats and I love cheese, but the notion of going to a restaurant and ordering a combination of the two always struck me as something of a rip off. Then I tried Jamie’s antipasti plank. To say that Luke hit the nail on its noodle would be an understatement; this is simplicity and excellence on a 12” piece of wood. The presentation is exquisite, the flavours are varied and delicate, the slaw is one of the best things I’ve ever tasted… Every single ingredient has a purpose and serves that purpose to perfection. Luke – “Absolutely, and that’s the great thing about this place; the message. Come and try what we do, then make it at home for yourselves and your friends, and you’ll always remember where you found your new favourite dish. That’s what really works. Remember the question I asked? From that one simple question, the conversation turned naturally to the restaurateur’s ethics, attitude and the roots of his brand. Again, none of this seemed forced. There were no buzzwords, no blue sky thinking, no hyperbole, just an honest chat between two guys who genuinely love their work. Luke mentioned Jamie’s social awareness, which offered me a neat segue into discussing the Essex lad’s own extracurricular activities and how they’re reflected at the pointy end of his business ventures. Jamie Oliver has long been campaigning for healthy school meals. Has Jamie’s Italian Leeds had any involvement in this? Luke – “Yeah, child nutrition is so important to Jamie, you know, he has kids of his own, which is why – just going back to the menu – we’ve won Soil Association awards for having the best kids meals in terms of ingredients; is it balanced, is it healthy, what’s the salt content, what’s the fat content, offering a fresh juice instead of cordial or fizzy, there’s a salad with every meal. It starts from the restaurant, we want your kids to eat well here, to have good quality food. Their pasta is the same as the adults’; fresh-made on site. Their bolognese sauce is the same as the adults’ – minus the wine, of course! – so, it starts right here. It’s never been forced on us here in Leeds, but we’ve always been proactive in working with local schools. I’ve been quite heavily involved since I started here – probably because both of my parents were teachers – so I’ve had a lot of association with child education. I’ve had groups of five or six year olds in, groups of 12 or 13 year olds in, and we’ve made fresh pasta with them, which they then take home. That’s something we in Leeds have been really big on, because we want people to understand what we’re all about, to be accessible; this isn’t an adult only restaurant, it’s a family place, bring your friends… the Italian way! Family time! That social awareness is really important to us. So, that’s something that you come up with individually, in each restaurant? Luke – “I work here, so I take it for granted, but some of the kids have never been to a restaurant before. And you get em in and take em about the place, and they love it. It’s a brand new experience. That’s why we get into the schools, to teach them about this industry, what’s great about it. That needs to start from a young age. Talking to them about food, why it’s important, why we should eat fresh food. I arrived at Jamie’s Italian entrenched in my own cynicism, expecting distasteful schmoozing, stuffy formality, and the arrogance and laziness that so often comes when a product or service has links to the world of celebrity; as though a recognisable name alone should be reason enough to part with your hard-earned, and how dare you demand more than that! What I found is something else entirely. When Jamie Oliver first appeared on our screens as The Naked Chef, my scornful self saw the sliding down bannisters, the trundling to farmers markets on a Vespa, the ‘lovely jubbly’ Essex patter, and just couldn’t believe it not to be some media-borne orchestration. When he first started the school meals campaign, my first thoughts were that it was a campaign with publicity and cash at its heart. Oh how harshly the cynic judges! Speaking with Luke and Jaz, witnessing their passion for the business and its underlying ethos, and hearing of some great community work being carried out – not just in Leeds, but other outlets as well – with no prior instruction from head office or the PR department, my pessimism began to pale. So, what can we expect from Jamie’s this year? During my years on the frontline of the nation’s – and indeed the planet’s – largest organisations, my indignation at what I saw as unfair practices and my occasional penchant for belligerence have caused me to clash heads with more than one or two managers. Through all the bureaucracy, sycophancy and nepotism that a cynic like myself has wont to witness in these establishments, the main thing that grinds my gears – and is almost ubiquitous throughout large organisations – is an obliviousness towards frontline knowledge. Holly Jackson is the General Manager at Jamie’s Italian Leeds. An urbane woman who manages to be at once lively and relaxed, she and a team of managers returned from a meeting at the head office in London, just before we began our interview. Their arrival brought with it a palpably electric atmosphere of excitement, as nearby staff gathered around. The last time I saw this sort of glee was when a mate of mine met Napalm Death in a kebab shop in Nottingham, around thirteen years ago! What news from old London town, good lady? Quite simply, a new menu had been finalised. OK, I’ve worked in a fair few pubs, and a new menu launch is an occasion over which one makes something of a big deal. But, upon hearing talk of the finest matured steaks, burgers made by trimming said steaks to size and mincing the beautifully aged meet to make patties, the genuine, salivating excitement of the staff was a stake through the heart of my cynical self. Dracula the detractor! Sucking the life out of simple pleasures in the search for subterfuge. Every single person I met just ‘got it’; the Jamie’s ethos. In fact, I correct myself! They all seemed to align with it naturally, as individuals – and that only strengthens with time in this kind of working environment. What I witnessed is the result of blending a strong, respected brand with first class recruitment and career development. Add to that the fact that its an independent business, providing jobs, training, money, education and social work in the areas from which they harvest their most valuable crop – the workforce – and its evident that the former pastry chef’s ‘love, share, inspire’ ethos resonates from the CEO to the KP. Jaz had mentioned a certain awe that comes from the buildings that Jamie and his team choose to house their little slices of Italy. Looking around – eyes freshly freed from the blinkers of too cynical a viewpoint – I took in the place anew. Restored, yes. To it’s former glory? No. And all the better for it. Much of the original decor is still intact, and that which has fallen into disrepair has been secured and left that way . An excellent move, in my book, and when used on a building so rich in history as this, one only need add a few glass cabinets and info plaques, and you would be forgiven for expecting a guided tour in seven languages. As I sat there – sanitised of cynicism – I saw a new, and much grander glory than the building’s former fiscal functions. Maybe it’s just me, but I think I got an inkling of a message from the birthday-suited baker boy; a subliminal recipe, shall we say? An independent business, which – in my home city at least – has taken root in the abandoned premises of dead corporate giants.